With this Friday being Armistice Day, I think it is important we all pause and remember those who made the supreme sacrifice. Railways played an important part in World War 1, with many Australian railway personal involved both here and abroad. ANGRMS has a direct link to WW1 as we have a genuine WW1 war relic in our collection – a Hunslet 610mm gauge steam locomotive which saw active service in France. Light railways played an important part in WW1 in France. 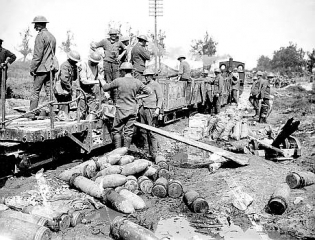 In the environment of the Western Front, main line railways could get no closer than five to eight kilometres from the trenches, as they were a prime target for artillery and were very expensive to install and maintain. Also, below is a copy of a letter sent home from one of the Australians who helped operate the “Light Railways” in WW1.